The terms dental periosteum or desmodontium can also be applied to the periodontal ligament (or membrane). This is a firm, fiber-rich connective tissue between the surface of the tooth root and the inside walls of the alveoli with which the tooth is joined to the alveolar bone.The periodontal space is where the tissue structures of the periodontal ligament are found. Its volume varies from single-rooted teeth (30 to 100 mm3) to multirooted teeth (65 to 150 mm3) and corresponds to the volume of the particular cementum. The tissue elements of the periodontal ligament are connective tissue fibers, cells, blood vessels, and nerves. The cells undertake a diversity of physiologic processes and are involved in the resorption and remodeling of the cementum and alveolar bone.These cells are cementoblasts, osteoblasts, osteoclasts, and fibroblasts, as well as epithelial cells and leukocytes. The last of these fiber bundles cross each other and provide anchorage to the root to protect the teeth against twisting (Fig 3-23). The bundles are not stretched in a straight line but follow an undulating path, which means tooth movement is possible because of the difference in length between their coiled and taut states. The fibers make up about 75% of the volume, the remainder being reserved for vessels, nerves, and free cells. 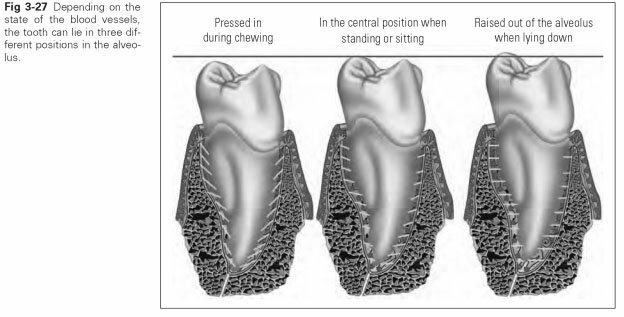 The cementum surface area onto which the fibers can attach is an average of 270 mm2 for single-rooted anterior teeth and between 400 and 450 mm2 for multirooted molars. Roughly 28,000 collagen fiber bundles can attach to 1 mm2 of this root surface. 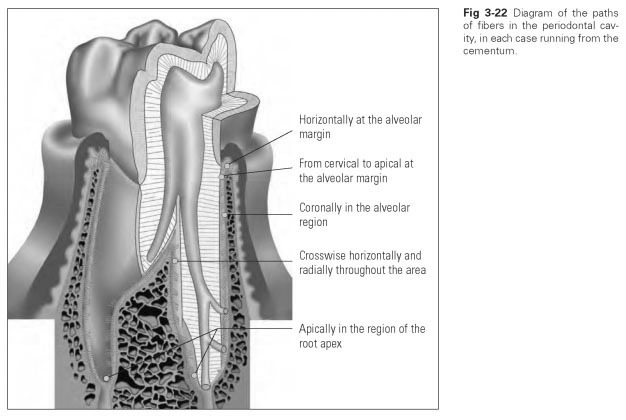 However, because the area of the alveolar compact tissue is about 10% smaller than the corresponding root surface because of the many perforations, the maximum area available for anchorage is 140 to 225 mm2 for anterior teeth, 170 to 200 mm2 for premolars, and 300 to 400 mm2 for molars. The functional loading on the tooth determines the density and thickness of the fiber bundles, just as the width of the periodontal space varies depending on the form of loading. Thus, the space is narrower in the middle of the root and widened cervically and apically; ie, it can take on an hourglass shape. 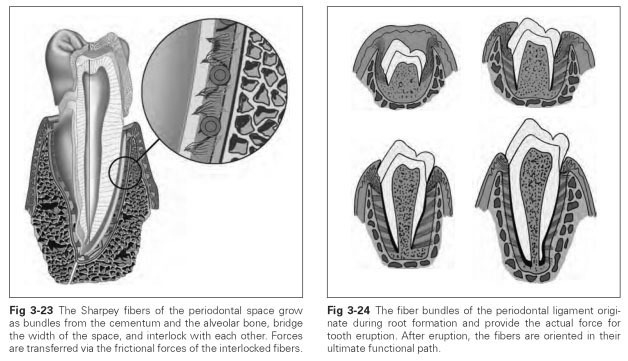 The fiber systems of the periodontal ligament adapt to changing functional demands (Fig 3-24). Active fibroblasts ensure the breakdown of old collagen and the formation of new fibers.The collagen regeneration rate is very high but decreases with age. The formation of new fiber is stimulated by loading caused by masticatory function or by tooth movements controlled for orthodontic purposes. If there is a lack of mechanical stimuli, atrophy of the fiber system ensues, the bundles decrease in density, and the periodontal space can become narrower. This also reduces the functional capacity of the periodontal ligament. The cells of the periodontal ligament, like those of the cementum and the cribriform lamina, originate from the dental follicle. Before eruption, the dental follicle is mostly transformed into the periodontal ligament as the active fibroblasts of this cell structure start to synthesize collagen fiber bundles. These fibers are embedded in the developing cementum and in the alveolar bone. The fibers run along the cementum, lying parallel to the tooth axis in a coronal direction, with the fibers embedded in the cementum developing first. After that, fiber bundles running in an apical direction and interwoven to form a lattice are also laid down in the alveolar bone (Fig 3-25). The vessels are thicker at the root apex than in the marginal area and enter in several places at the root apex and in the alveolar segment. In the marginal area, the vessels are arranged as oneway passages, which causes vascular congestion to build up there. The tightly interwoven vessels of the periodontal space do not have any clear-cut venous outlets, but they follow the arteries. This supports the assumption that there is a pendular blood supply here that is stimulated via a shift in the volume of the vascular network caused by tooth movement.The tooth is raised out of the alveolus by blood pressure as the blood vessels become engorged with blood. During chewing, the tooth is pressed into the alveolus, and thus the blood is forced out of the vessels. This results in an exchange of blood; ie, the blood supply is set in motion by loading on the tooth. Lymph is drained via lymph capillaries through the gingival tissue. Otherwise, the system of lymph vessels follows the same kind of basketlike distribution in the periodontal ligament as the system of blood vessels does. The nerve supply in the periodontal ligament is very extensive. This makes the tooth a sensitive, tactile apparatus because it is able to pick up and cushion changes of position and loading and thereby regulate the reflex mechanism with the masticatory musculature. Two types of nerve fibers run in the periodontal space, namely sensory fibers and fibers of the autonomic nervous system. As branches of the dental nerve, the fibers enter the periodontal ligament apically. 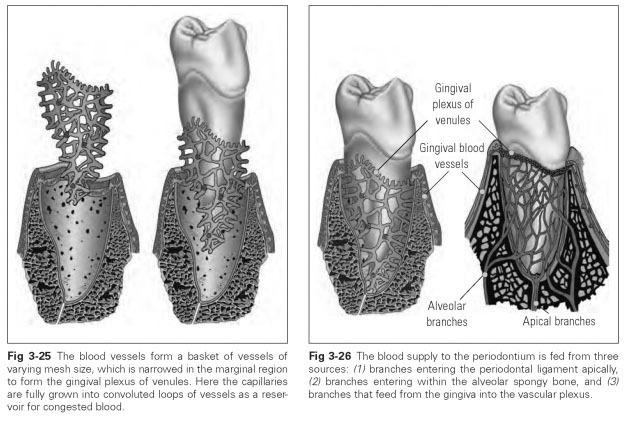 The fibers from alveolar entry points also link up with the dense network of nerve fibers. The nerve fibers are either open-ended with tuberous swellings or end in spiral-and ring-shaped receptors. Via the trigeminal nerve, there is a reflex path to the motor end plates of the masticatory muscles as well as to the muscles of the cheeks, lips, and tongue in order to regulate abnormal compressive stresses. Nerve impulses are picked up in response to pain and pressure. The perception of pressure is so sensitive that the tactile quality can even exceed that of the fingertips. Via a pain message, the nerves indicate when the tooth or the periodontium is being overloaded or when the threshold of mobility is reached. It is clear from this that the periodontal ligament plays a key role in the functioning of the teeth; a tooth with destroyed pulp is more likely to be preserved than a tooth with a defective periodontium.Thus, post crowns, where the pulp has been removed and a post has been placed in the exposed pulp cavity of the root, are a popular option in dental restoration. However, if the periodontal ligament is removed, the link between tooth and alveolar bone ossifies, and the tooth is no longer as capable of bearing stress. This is what happens when a tooth is extracted for root treatment and, after treatment is completed, reimplanted in the cleansed socket. This clinical treatment option is only adopted in very particular circumstances. A buffer effect is achieved by the fiber apparatus and by the network of blood vessels. The fiber apparatus transforms masticatory compressive forces into tensile forces because tensile stress is the natural, physiologic stress borne by the hard tissue. The arrangement of the fibers in the periodontal space allows minimal tooth mobility, while the nerve supply registers the loading threshold by means of a pain warning. The blood supply to the periodontal ligament is ensured by tooth mobility; ie, optimal blood flow in the periodontal ligament is only ever achieved when the tooth is placed under stress. This clearly illustrates how the law of form and function operates: Blood flow in the periodontal ligament is particularly important when the tooth is being loaded, and it is that very loading on the tooth that controls the blood flow.